Employers look for someone who offers the “whole package” when hiring. An applicant who has the skills, expertise, and experiences to meet the complex challenges their company faces. “Soft skills” such as integrity, accountability, common sense, motivation, energy, enthusiasm for the work, humility, intellectual curiosity, are the emotional intelligence factors that will weigh equally in helping you get noticed in today’s workplace. These traits combined with the appropriate proficiencies will make you stand out as an ideal candidate. Take a personality profile test, like the Myers-Briggs, StrengthFinder 2.0 or the DiSC. These tests will inform you of your strengths and help you identify the types of jobs and industries that best fit your skills. Describe briefly and with precise examples the ways in which you have delivered impact to your current organization, your colleagues, or your customer base; the ways in which you tackled difficult challenges, and managed projects. Did you deliver results to your business unit or connect people across functions or departments? Have you achieved unexpected results? Or perhaps you’ve done something that others thought was impossible? Demonstrate that you have taken responsibility for your career and for helping others achieve their potential. Listing off your employer’s achievements says nothing about your personal accomplishments. Instead, explain in your cover letter if you ran a marketing campaign, what were its specific goals and how did you help your employer achieve these goals? Providing specific metrics ensures you were a key player on that project and instrumental to its success. Everyone wants to hire a winning employee, so make sure your resume highlights your specific accomplishments, especially those that are transferrable to your desired next position. It goes without saying, but always remember to research the company before your interview. Those interviewing you will appreciate your diligence and it will likely give you huge leg-up on the competition. Show you’re someone who is self-motivated and genuinely interested in advancing their company’s strategic and financial goals. Give ways you’ll take time to explore innovative ideas and technology. Stand out as an all-star by identifying an acute pain point your prospective employer is struggling with and share some research that could help provide them with a solution to fix that problem. Reinforce your capability to be a problem solver by sharing a specific incident where you successfully tackled an employer’s tough challenge and achieved great outcomes for them. In order to show you’re dedicated to their work, and not just looking for a job, make sure your resume highlights your genuine interest in the company’s mission through previous experiences. Employers care about many things, including but not limited to core qualifications, leadership qualities, personal integrity, passion for the work there, and intellectual curiosity. Give proof that you’re adept at multitasking, but be clear that you also can focus when necessary on a singular task. Have examples when you helped the firm achieve its goals when it required you handle multiple responsibilities and another time where it required you go deep into researching a specific issue to solve a problem. Applicants should ask themselves whether their resume highlights a particular activity, event, or action that is an example of a willingness to step up, inspire, and lead others. A standalone resume lacks context. It shows nothing about the personality of the prospective hire and is simply a list of ingredients. An exceptional candidate will add context beyond the resume that clearly shows her interest and knowledge of the position. It’s important to demonstrate your expertise with stories, not words. In Dorie Clark’s book, “Reinventing You”, she stresses showing humility in your narrative. Saying “I’m great at pitching investors” sounds pretty egotistical, but sharing a compelling tale of how you rounded up seed funding allows others to deduce your skill without having to make it explicit. 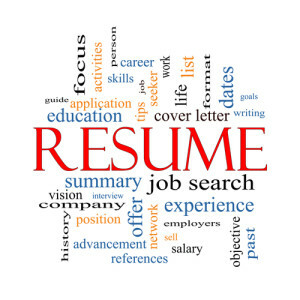 Be sure to accompany your resume with a cover letter. Check your syntax, word choice, grammar, spelling, and anecdotes–these are all crucial elements that distinguish a good candidate from a great candidate. When you’re a great fit for your job you’ll be more likely to have an impact, feel appreciated and enjoy your work. So take time to invest in finding the intersection between what you bring to the table and a prospective employer’s needs. This way you’ll find that “sweet spot” at work and make an employer recognize he’d be crazy not to hire you!